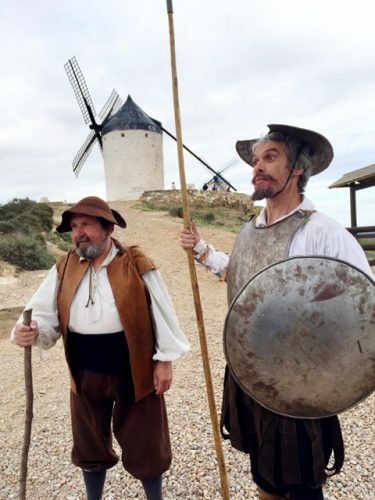 ‘Don Quixote’ and his squire, ‘Sancho Panza’, posing at the windmills. They made for terrific tour guides! As someone living in the Netherlands, a country that’s famous the world over for its windmills, I’m naturally intrigued every time I stumble across these wonderful machines anywhere in the world. During my trip to the region of Castilla-La Mancha in central Spain, I visited the beautiful windmills of Consuegra (map). Located about 60km from Toledo, Consuegra is a lovely historic town set against a range of low mountains. Twelve windmills can be found atop the Cerro Calderico ridge, along with a striking 12th century castle. Fans of the Spanish writer, Cervantes, will instantly recognise these windmills, which were prominently featured as the ‘giants’ in the ‘Don Quixote’ novel. Standing proudly atop the ridge, with their white cylindrical towers and blue, pointed roofs, I can imagine why Cervantes felt so inspired by them! It’s not entirely clear when the windmills of Consuegra were built but they became famous when Don Quixote was published in the 16th century. According to local tradition, the windmills, used primarily to grind grain, were passed from father to son for many generations before being ‘retired’ in the 1980’s. The windmills have since been lovingly restored. One of them houses a gift shop while another is a small museum. There’s even a working mill so visitors can see how it works. Check at the tourist office for Don Quixote themed guided tours. The windmills and the castle atop the ridge. The historic windmills of Consuegra. Don Quixote, looking out to the plains of La Mancha. You can hike up to the windmills from the town or you can drive up to the ridge (there’s free parking). Whichever way you choose, you’ll be rewarded with panoramic views of the semi-arid plains of La Mancha and the gentle hills that stretch into the horizon. Along the way to or from the windmills, be sure to stop at the La Muela or Consuegra Castle. Originally built by the Arabs (possibly in the 10th century), the castle was modified and expanded in the 12th century by the Order of Saint John of Jerusalem. The windmills and the castle combine to create a unique medieval atmosphere, something which won’t easily go unnoticed. I also recommend a stroll around Consuegra. These days, the town is famous for its high-quality saffron and its annual Rose of Saffron Festival. Drop by at the beautiful town square (Plaza de España) and its 17th century Renaissance-style Town Hall. You can also find several gorgeous churches in the Mudéjar style (a blend of Moorish/Arab and Gothic influences). The Plaza España in Consuegra with the Town Hall. At a corner of the square, you’ll find Café La Antigua, which serves a terrific saffron-infused gin & tonic! It’s also a great place to mingle with the locals and taste some local specialties. Your’s truly enjoying a fab saffron-infused G&T at Café La Antigua. Consuegra can be visited as a day-trip from Toledo or Madrid. 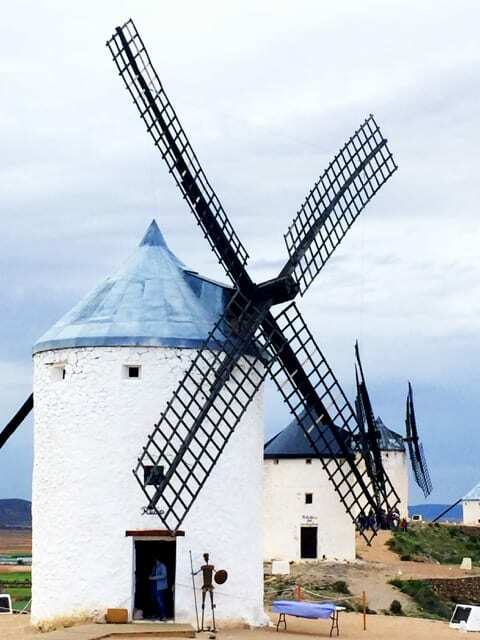 If you’re a fan of Cervantes, check out the Windmills and Don Quixote route which winds its way around the La Mancha region. Search for hotels in Consuegra (Booking.com). Note: my trip to La Mancha was part of the #inLaMancha blogger project, a collaboration between iambassador and the Spain National Tourist Board. As always, all views expressed above are mine, and mine only. I often hear that story too – locals not being very enthusiastic about a certain attraction/site and visitors thinking differently. It’s indeed not too far from Madrid. You can drive there, see the windmills and castle, have lunch in Consuegra and drive back. It’s so funny, because as an expat in Spain, I’ve asked Spaniards about the famous Don Quixote windmills a few times and everyone is always so dismissive, saying that they’re just in one place and not that impressive. A classic case of getting used to the history and beauty in your own country! Even after living here for 2 years though I haven’t been to the windmills yet, your photos look beautiful and makes me want to make the trip – from Madrid (where I live) it wouldn’t be far! Cheers! Enjoyed your article. A few months I saw the windmills on a travel show, “Spectacular Spain” with Alex Polizzi. 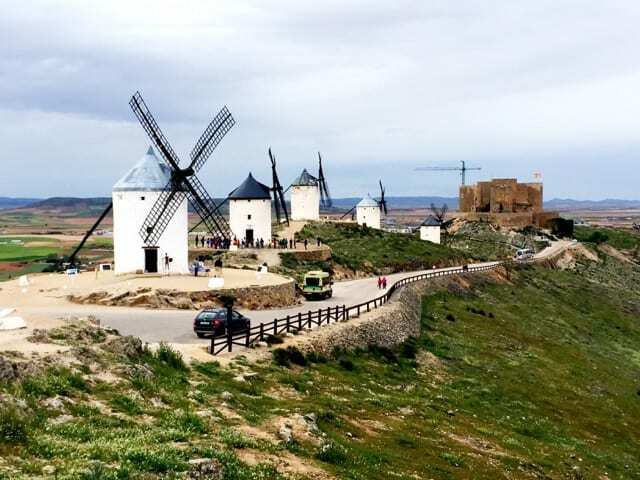 In one episode she visited Consuegra & the windmills. I didn’t deliberately set out to find them, knowing only that they were “somewhere south of Madrid” but we stayed 2 nights in Toledo before heading south of our house in Murcia. I saw a line of windmills in the distance then saw the sign for Consuegra and realised that we had stumbled across them more or less by accident. We drove up and looked at the windmills but also the Castle which is also well worth a visit. I also worked in a bank, I know how much you must have enjoyed your escape. Good for you, enjoy life. I just checked out a number of windmills in Europe last summer, but missed Spain altogether. I never thought of it as having windmills, so thanks for the intro to them and photos. The legend of Don Quixote is an entertaining one … nice cocktail at the end of the day too!